Updated Filming for the screen adaptation of Jonathan Tropper's This Is Where I Leave You got underway yesterday in NYC. The first day's shooting location was Oakland Cemetery, 2 Saw Mill River Rd, Yonkers, NY. according to On Location Vacations. Not sure if they've moved on yet or not - depends on the length funeral in the novel, I s'pose. (10am Update: OLV reports the film is shooting today at Coler-Goldwater Hospital on Roosevelt Island.) Tropper wrote the screenplay himself; the only other screenwriter credit is as writer/producer credit on the show Banshee. I wonder if he already had a finished product in hand when the producers approached him to write the script ... or who approached who first? "The death of Judd Foxman's father marks the first time that the entire Foxman clan has congregated in years. There is, however, one conspicuous absence: Judd's wife, Jen, whose affair with his radio- shock-jock boss has recently become painfully public. Simultaneously mourning the demise of his father and his marriage, Judd joins his dysfunctional family as they reluctantly sit shiva-and spend seven days and nights under the same roof. The week quickly spins out of control as longstanding grudges resurface, secrets are revealed and old passions are reawakened. Then Jen delivers the clincher: she's pregnant. 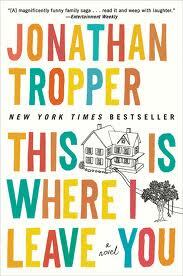 This Is Where I Leave You is Jonathan Tropper's (One Last Thing Before I Go) most accomplished work to date, and a riotously funny, emotionally raw novel about love, marriage, divorce, family, and the ties that bind-whether we like it or not." Shades of Joshua Henkin's The World Without You* in that they both deal with the death in a large, dysfunctional Jewish family with depth and humor. *That's a book I'd like to see adapted by the way! Click my take for my thoughts on The World Without You by Joshua Henkin. The cast of This is Where I Leave You includes Jason Bateman as the son, Judd (unless they change the name) Tina Fey, Adam Driver (Girls) and Corey Stoll; his siblings. Abigail Spencer is Bateman's estranged wife, Jen. Rose Byrne is Bateman's love interest; a role reportedly read for by Isla Fisher, Zoe Saldana, Mary Elizabeth Winstead and Ari Graynor. Timothy Olyphant is Fey's once-upon-a-time love; he still lives at home, due to a brain injury, across the street from the Foxman house. Deadline also reports that Dax Sheperd will play a "Stern-like radio shock jock" - presumably the boss Bateman catches sleeping with his wife. Ben Schwarz (Parks and Rec) is the family's rabbi trying to help smoothe the process of sitting shivah along. And now Connie Britton (Friday Night Lights) has joined the cast as an 'age-inappropriate girlfriend' to Driver's character, the baby of the family. Plus she's a therapist and he's got a lot of problems. Have you read Tropper's book? What do you think of the casting? Here's hoping that director Shawn Levy can do justice to the novel; he did Date Night with Fey and that wasn't so hot. Very conventional and predictable. This sounds like material that would be magic in the hands of someone like Jason Reitman (Up in the Air, Young Adult) who knows how to tell an authentic adult story about human relationships. Levy, on the other hand, may be equally sharp but his resume is full of TV movies and formulaic comedies like Date Night, and Cheaper by the Dozen. Some laughs but little nuance. But that's neither here nor there; Levy is on the job. More details as info and first pictures surface online. I read another Tropper book that I didn't like, but this cast looks amazing. I'm excited too. I've been watching Corey Stoll in House of Cards; really charismatic and unique. Was this filmed in Cleveland, or just in NYC, and vicinity?